The story of a couple on Miami Beach stoners making millions running arms? Sounds like it could be right up Todd Philips' alley. Phillips, fresh off the commercially successful, but wildly reviled "Hangover Part II," has optioned the film rights to Guy Lawson's Rolling Stone article "Arms and the Dudes," reported Variety. Lawson's piece tells the improbable story of how a couple of doofuses somehow wrangled a $300-million contract with the U.S. Military to supply weapons to to our allies in Afghanistan. Not surprisingly, the story ends with our "heroes" in federal court. Phillips will serve as a producer on the film, but hasn't yet decided if he'll direct. 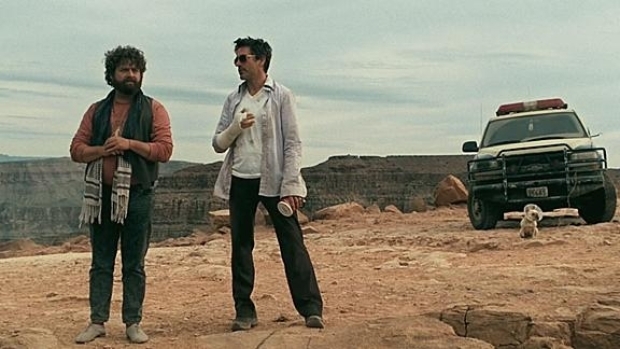 Robert Downey Jr and Zach Galifianakis race across the country in the hopes of getting RDJ home in time for the birth of his first child. Speaking of arms dealer comedies, if you haven't seen "Lord of War," we highly recommend it. It stars Nic Cage in what currently stands as his last good leading role as a Brooklyn-born Ukrainian-America arms dealer in a game of cat-and-mouse with an Interpol agent played by Ethan Hawke. Written and directed by Andrew Niccol (the upcoming "In Time"), it's a funny, exciting and bleak look at the realities of global conflict.